ALL YOU NEED IS THIS BOOK That is right. All you need to run this game or play a character is this book! 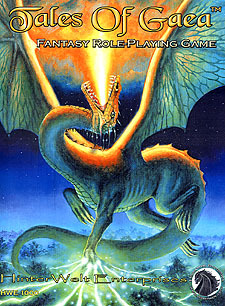 No player's guide, no monster books and no setting books required. Your only investment is this book, dice, paper and pencil. SKILLS BASED SYSTEM A system which allows you to build your character with the skills you want. Customization of your character allows fighters that cast magic, bandits that fight, and wizards with plate armour and two-handed swords. FREE ON-LINE SUPPORT Ever wish you had help with a new system? Now you do. The CHARGen Character Generator and Vault guides you you through Character Generation, Stores it, then allows you to retrieve it wherever you have an internet connection. SIMPLE YET REALISTIC This system is simple and yet flexible enough to allow the player to run a wide variety of characters. The game master has the ability to cutomize heavily without the need to create new rules. The entire system embraces a level of realism that encourages play without hampering the flow of the game.